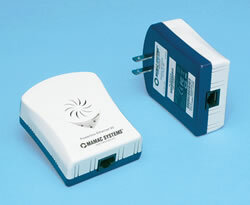 IP-PLE-85 Bridge converts any line voltage power outlet into a ethernet network connection. No software to load, no configuration, no training or setup; just plug it in and connect any ethernet device with a standard CAT-5 patch cord. The bridge can also be used to extend the range of wireless 802.11 ethernet networks. Conforms to IEEE 802.3i 10BASE-T and IEEE 802.3u 100BASE-TX standards and provides a fast 85 Mbps ethernet connection. IP-PLE-85 is a low cost, environmentally friendly solution for networking Mavericks or any other ethernet device in schools, colleges, office buildings, shopping centers, strip malls, homes or any other commercial, retail or residential application.